This may be the highlight of the World Cup so far. 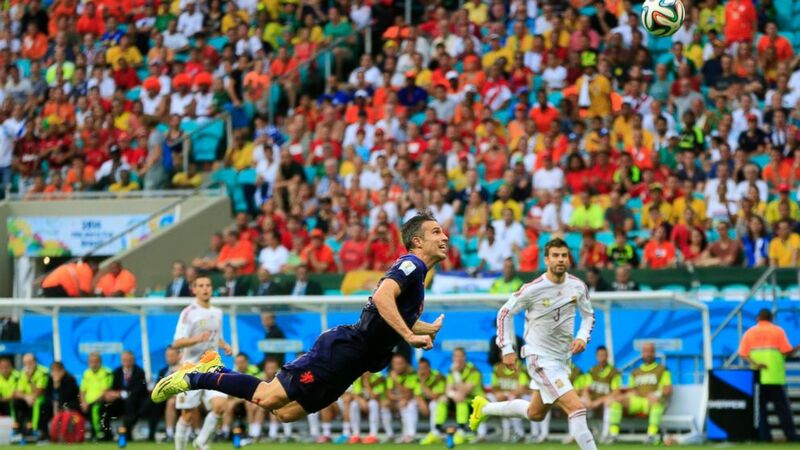 camera (Bernat Armangue/AP Photo) The Netherlands' Robin van Persie attempts the header that scored a goal during the soccer match between Spain and the Netherlands at the Arena Ponte Nova in Salvador, Brazil, June 13, 2014. Robin van Persie can fly. The Dutch striker scored a stunning goal against Spain today in what is sure to be remembered as one of the greatest moments of the 2014 World Cup. As the ball floated across the field, van Persie scored a diving header from 15 yards away that went straight past Spain's goalkeeper Iker Casillas. VOTE: Who is the Hottest Player in the World Cup? The goal ended Casillas' streak of 476 minutes without allowing a goal at the World Cup and tied the game at 1-1 going into halftime. That's the third longest streak in history. The Netherlands ended up winning the game 5-1.